The word ‘HENGE’ – What does it mean ? a Neolithic or Bronze Age monument of the British Isles, consisting of a circular bank or ditch enclosing, variously, stone or timber uprights, burial pits, etc. Stone Henge – What is one? A henge is the term given to a large prehistoric earthwork, usually but not always circular, whether of stones, wood, or earth. This word, interestingly, is a back-formation from Stonehenge. Additionally some spell it stone henge or stonehedge even though that is incorrect. Stonehenge was the Saxon name for the famous monument on the Salisbury plain, and the “henge” part is Old English for “hang,” not earthwork. Nonetheless, the term henge is in wide use in both popular and scientific literature to refer to megalithic monuments of the Neolithic and Bronze ages. Whether you are thinking stone henge or Stonehenge, both are basically Megaliths. Megaliths are single large stones, or a group of “standing stones” usually arranged in a circular or semi-circular formation, and that archaeologists believe were religious temples or monuments. The earliest sites are thought to date back to the millenia. The word, “megalith” itself has Greek origins: “mega” meaning “great” and “lithos” meaning “stone”. Certain megalith sites, and there are thousands of them all around the world, were also known burial sites. England seems to have the greatest concentration of megaliths that carry names like Avebury, the Hurlers, the Merry Maidens, and the Rollright Stones. The most famous of these is, of course, Stonehenge. People do commonly mistake the words stone henge for Stonehenge and should learn the difference so they may find the correct information. 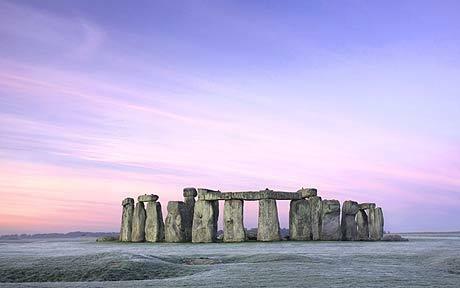 Titchmarsh on Telly the other evening in a prog on English buildings started with Stonehenge. The ‘expert’ stated that the ‘henge’ element of the name ‘stonehenge’ meant, or referred to, the ditch and embankment surrounding Stonehenge. The original sense is a difficult one to call: henge is obviously related to hangan. It could mean that even in ASJ times, some of the stones were leaning over (they were straightened dramatically in th C20th), or might be related to ME henge in the sense of “hinge” — possibly referring to the mortise-and-tenon joints. There again, “stone gallows” is a good description — ASJ gallows were two posts and an crossbeam , and we know it *was* used as a cwealmstow. Am wondering about the etymology of words henge and hedge. Am more interested in history of hedging, how ditch,(moat) bank,and hedges were aligned. Their function as enclosures in agriculture, for containing livestock, for ritual, or for defense. Are the archeologists forgetting to factor in missing hedge boundaries within neolithic landscape? What do hedges or ‘groves’ mean to the human psyche? Are they a throw-back to life in a clearing in the woods?